How can you stay safe on the open water? Staying safe is an absolute essential when you’re out on the open water. The ocean can be a treacherous place, and when you’re fishing for big game, you could find yourself in a tight spot. Rather than leaving it up to chance, you can use these tips to optimize your fishing experience and stay safe. Are you ready to dive in? Let’s take a look. Hooks end up in hands, fingers, and other body parts more often than they should. They’re very sharp and very painful, so awareness of these dangerous devices is key. When casting, make sure that no one is standing behind you or anywhere where the hook could hit them. 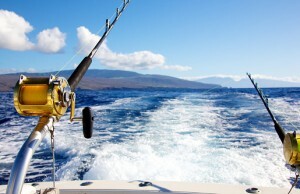 You should also take caution while boating a fish, rigging up, or removing the hook from a catch’s mouth. Always hold the hook at a 90 degree angle when pulling the line It seems like a really simple tip, but a lot of anglers forget to be careful and end up getting hooked. Protective clothing is not optional to stay safe on the open water. Between the hot sun and the dangers of fishing hooks, there are a lot of reasons to wear protective clothing. Gloves can help a lot when dealing with long stretched of rope, gripping the boat on choppy waters, and keeping your rod firmly in hand. Always wear an ample coating of sunscreen when on the open water and don’t be fooled by cloudy skies. The sun can still do a lot of damage even with cloud cover. Keep a knife, but be smart about it. Having a sharp knife on your person while fishing is a smart idea. Cutting a line or freeing something from being tangled need to be done quickly, with a sharp knife. However, when the knife is not in use, it should be sheathed.